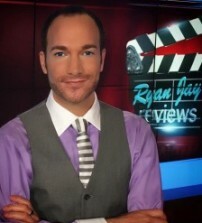 Ryan Jay is a nationally syndicated radio film critic, based on his website RyanJayReviews.com. Ryan can be heard live on the air Friday mornings on FM stations across America in addition to hosting a weekly movie review segment for Premiere Networks, distributed to hundreds of markets across the United States. He also reviews movies weekly on the NBC-TV affiliate in Milwaukee, WI. Most passionate about movies and pop culture, Ryan has cultivated a career celebrating entertainment and sharing his unique perspective with TV and radio audiences. Often on the red carpet at movie premieres and events, he has interviewed many of Hollywood’s A-list celebrities. And every other week he can be found in the pages of Us Weekly magazine as Fashion Police. Ryan has worked as a television producer of major pop culture and entertainment programming for networks such as Bravo, Showtime, MTV, VH1, Nickelodeon, TLC, and even The Jerry Springer Show.